Thanks Ya'll for the comments... Sorry that I just haven't had much energy to blog! But, the good news is that I now have cable tv and Internet at my house! Wheee! So, I don't have to be at church to check my email! It is still looking very much like Bu has what is called Wobblers. It is a condition that presses on the spinal cord and causes neurological issues. However, because we moved, we are MUCH closer now to a Vet who does an alternative treatment for it. Who knew that a Vet in Marion, Indiana would be the MAIN person who does gold bead implants. We have an appointment on May 5th -- He will give Bu an exam and then take 1 more x-ray to try and confirm if this is what is going on with my boy. Then if they do find that it is Wobblers, they will go ahead with the implants. This is a minimally invasive treatment that should help -- if not reverse some of what has been going on, at least it should prevent anything from getting worse. Western medicine meets Eastern medicine -- but the people who speak of this Vet speak highly of him...and all that is written on acupuncture and gold bead implants in dogs is done by him. He's only 2.5 hours away! Other than being insanely dopey -- Bu is fine. He's loving the fact that he's getting green beans at 2 meals a day, he loves the new back yard -- but I've got to put something around the tree because he keeps biting off the bark! Grrrrr. We don't run and play much because watching him fall over bothers the heck outta me but it doesn't seem to bother him much! Now that I have the box springs back in my bed, he really can't get up on the bed without help! It's just too high! And, yeah, it is sad but true... I help a 136lb great dane up into my bed where he proceeds to hog every inch of space and I end up curled into a ball. *sigh* The stupid thing us pet owners do! I'll update pictures soon. The unpacking process is exhausting. My office at work is finally all put together! Just in time for the installation service! Now, I just need to work on getting the house all settled in. 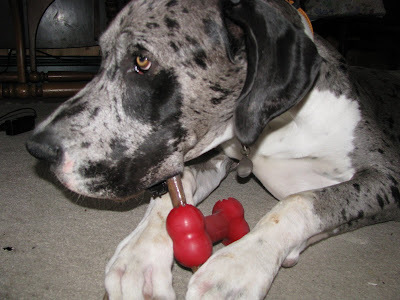 Ohh, and did I tell you that in his x-rays...the Vet in Toledo said that he's still got growing to do???? His growth plates aren't closed! Who'd have guessed! I think I'm going to have at least a 150lb dog on my hands!! PLEASE BE PRAYING. Long story short, it is starting to look like Bu has Wobblers. :( I am terribly worried and wondering what will be next. We are in the process of finding out more and trying to figure out a course of action. Poor Bu is very confused these days. We have our new house...and he likes the yard, but he is very needy these days (I understand dear Bu!) He's been knuckling over and just kind of having a tough time with his feet...and it comes and goes. VERY sad... so, please pray. Hey Mango Man my friend... Look what I gots! 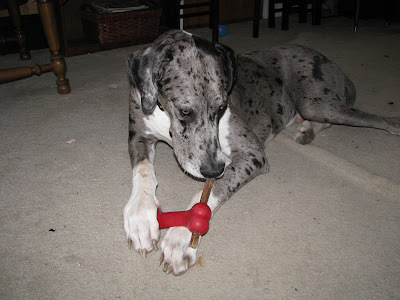 Yeah, it is a bully stick, but my momma decided to put it sticking out of the stupid kong bone. I think she thinks that it will take me a little bit longer to gnaw on. Sheesh. I had a trauma today -- I tried running up the stairs and slipped. Fell back to the landing. OUCH! Nothing was hurt. (But, I did get extra sympathy and I think this is the other reason I'm getting a bully stick today) Mom just keeps grumbling about moving and papers and papers and moving and hasn't taken me for walkies for EONS. Well, I don't make suds like you, so I'm going back to gnawing on my bully stick while mom works on the 'puter. Peace my friend -- Bugenhangen.